"He was and still is a phenomenon." The Manchester City forward, 24, has become one of the best players in the Premier League and is a mainstay in Pep Guardiola's quadruple-chasing side. After scoring twice at Crystal Palace on Sunday, Sterling has already bagged 17 league goals with five games remaining this season. He always had raw talent but what has made him the player he is today? And what can the England international go on to achieve? When youth worker Clive Ellington first spotted Sterling on the school playground, he knew he had found someone special. "He stood out for all the right reasons. It was almost like a one-man team," Ellington tells BBC Sport. "On the way home I asked him who he played for and he said: 'I don't.'" Shortly afterwards, Sterling joined local club Alpha & Omega FC - where Ellington remains a coach - and spent four years there before being snapped up by QPR and then quickly brought into Liverpool's academy. Now with City, Sterling is aiming to win back-to-back Premier League titles, while chasing the FA Cup and the Champions League to add - to the Carabao Cup his side won in February. Sterling is used to winning and, even as a kid, he struggled with the idea of losing. "Losing was not an option for him," says Ellington. "He was tearful when we lost. He just couldn't understand if team-mates weren't performing. He couldn't understand why somebody wouldn't be giving 100%. "If he thought the team didn't perform well, he'd let you know. If he didn't think he was offside, he would let the referee know he thought he was cheating. I had to get him to understand it was OK to lose." Sterling was described as a "quiet boy" off the pitch. Everyone used to say "it was with the football that he did all his talking". But when he did talk, it was only ever about one thing: football. "He would say that the little grass pitch behind his house was his Wembley stadium. That's where you'd find him." Sterling wasn't far off. He was 17 when he made his England debut, the fifth youngest player to do so. After Sterling made his Liverpool debut at 17, he quickly made a name for himself at one of the Premier League's biggest clubs. Within two years he had clocked up 129 games for the Reds and become one of their most important players as they finished runners-up in the Premier League in 2013-14. There was no doubting his talent - he had bags of it - but there had always been question marks over his end product and goalscoring ability. "Sterling reminded me in many ways of Theo Walcott in his early days," former Chelsea and Scotland winger Pat Nevin tells BBC Sport. "He would get it on target with power but he wasn't actually somebody who would place the ball like the great strikers do. "That's not something that people have gone on to learn generally. You're usually like that or you're not. He's weird in the fact that he's gone on and learned it. He has become someone who slows down and calms down in front of goal. He has turned it on its head. "You can be a bit daft when you are 19 but his maturing process has been fabulous." Sterling's potential was enough to land him a £44m move to Manchester City in 2015, making him England's most expensive player at only 20 years old. Manuel Pellegrini, Guardiola's predecessor at City, described his new forward as "one of the best attacking players in world football", and the expectation with which he arrived in Manchester was huge. Pellegrini gave Sterling 47 appearances in 2015-16. However, his tally of six league goals was one below his total for Liverpool the season before, and he picked up six fewer assists. His crossing accuracy, which had averaged 22.2% in his final season at Anfield, dropped to an all-time low of 5.6% in the first part of 2015-16. Out of the 54 crosses he made from open play during the whole season, only two had been successful. Under Pellegrini, Sterling's shot-conversion rate was 11.54%. When Pep Guardiola took over the following season, he said the forward had spent "many, many hours" working on his finishing with first-team coach Mikel Arteta. Sterling's understated domestic league form continued at Euro 2016 in France - and a telling moment came against Wales in Lens when he left the pitch at half-time accompanied by boos from the England supporters. With his career seemingly at a crossroads, he received an overwhelming boost - a personal text from new boss Guardiola reassuring Sterling about the key role he would play in Manchester City's future. The arrival of former Barcelona and Bayern Munich boss Guardiola in Manchester had a huge effect on Sterling. 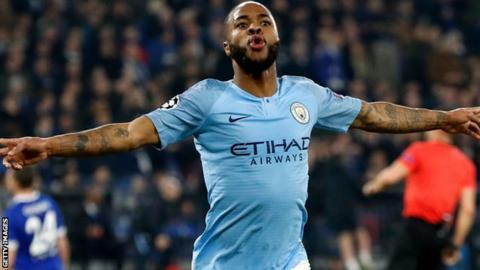 The way City play, the players they have and the lessons Sterling has learned under the Spaniard has unlocked his potential and turned him into one of the league's best attackers. In Guardiola's first season, he played 3,627 minutes. Only four members of the squad played more. He increased his goal involvements too - scoring seven and assisting 10 in the Premier League. In 2016-17, he registered seven goals and six assists, and created 46 chances. Of his dribbles, 79 of them were successful and six of his open-play crosses found their target. And now, in his third season under Guardiola, Sterling has recorded his best attacking stats yet - netting 17 goals and assisting nine, while improving his shot-conversion rate to 27.41%. Only Liverpool's Mohamed Salah (291) has had more touches in the opposition box than Sterling (257). "Sterling has been willing to learn," says Nevin. "Guardiola gets good players and wants to turn them into brilliant players. The standards and demands are so high under Pep that if you don't do things, you are out. "It is not vicious. It is just the way it is. It is an utter meritocracy. It doesn't matter who you are. "Sterling looks more composed in those goalscoring positions when under pressure now. He slows down, goes into better positions and is calmer than he was before. His attitude has matured. It is a whole bunch of things which have come together at the same time to add up." And Nevin believes a large reason for Sterling's improved success is down to the way Guardiola has set up his team to attack. City play with more width and cut the ball back into the six-yard box, which helps to explain why all but one of Sterling's goals have been scored from inside the penalty area this season. "It is the directness of Sterling's movement - he always gets into the same positions," adds Nevin. "Manchester City have one special thing. Players try to get to the byeline inside the 18-yard line. That sounds an easy thing to do but I spent a career trying to do that. "If you cut the ball back from that position it is the hardest thing to defend. If players get into those positions it is now a trigger - you must get into a specific area. Guardiola has put emphasis on this and it creates a lot of chances. "One of the players to benefit from this is Sterling. If you keep making that same movement into that same area, you will score bags of goals." This year, Sterling has started to translate his club form on to the international stage and his performances for England have improved hugely. After waiting 27 games for his first Three Lions goal, Sterling netted twice in a memorable 3-2 win over Spain and his hat-trick in the 5-0 thrashing of the Czech Republic in March was the first by an England player at Wembley since Jermain Defoe in 2010. The only England player to have made more appearances than Sterling (49) at 24 years and 105 days - the age Sterling was in his most recent game - and gone on to achieve their 100th cap, was all-time leading goalscorer Wayne Rooney (57). Manager Gareth Southgate said Sterling has "developed into an outstanding role model" and revealed the forward is among a group of players identified as leaders in the England squad. Sterling has also received praise for his comments on racist abuse. He said players should not leave the pitch if there is abuse from the stands because "if you walk off they win". He also supported Juventus teenager Moise Kean's reaction to abuse in Italy. Sterling was one of several England players to have racist chants directed at them during a Euro 2020 qualifier in Montenegro in March and was allegedly racially abused when Manchester City lost at Chelsea in December. Former Liverpool winger John Barnes has said Sterling is one of the most influential people in British society - and Nevin believes he has a bright future as a role model in football. "The way he has reacted to racist abuse has been fantastic," says Nevin. "I was so happy he made those comments. He is showing intelligence, maturity and his own mind. He can do anything. "Will he be an England captain in the future? Sure, but I don't see why that's important. He has bigger things than that. He can be a fabulous, world-class footballer and a role model. That's bigger than being captain."